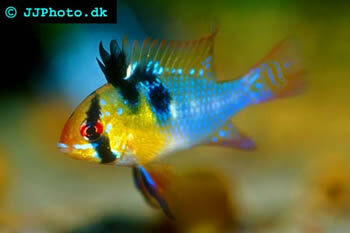 Common name: German Blue Ram, Blue Ram, Ramirezi dwarf cichlid, Asian Ram, and dwarf ram. Breeding: Once paired after courting they will generally clean off a rock at the spawning point. Some will lay on the rock some just lay in the substrate. Rams are not the best parents and removed fry generally have a lower mortality rate.Soft pH changes and a slight cooling of water temperature will often cause a pair to spawn. 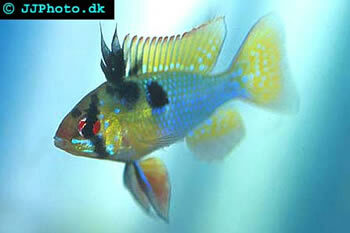 Best to start with 6 of so in a community tank to get a successful pairing.Peat will also encourage spawning.